I booked a return air ticket from Sibu to KL just now and mis-clicked on the departure date. I didn’t really notice the erratum until I checked the itinerary in my email. I went back and made amendments to the chronological discrepancy and was charged RM 150 for the “Change fee” (blue arrow). 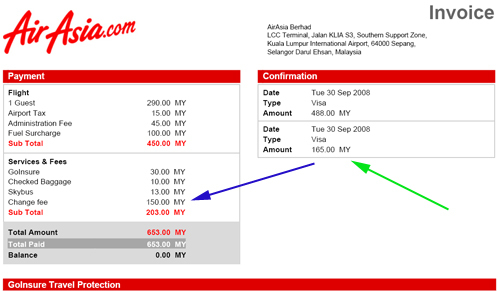 It came up to a total of RM 165 for the clicking malfunction (green arrow) which is fair enough, considering Air Asia’s status as a no-frills airline and it was my mistake anyway. However, it would be great if AirAsia allows for changes to the arrival/departure date and time for a certain period of time after the initial booking – a grace period, if you will. I suggest allowing changes 15-30 minutes after the initial booking gratis before the “Change fee” is levied. This will allow genuine mistakes to be resolved without the fiscal penalty while avoiding last minute changes from indecisive travelers due to the short grace period for changes. Anyway, that’s my two cents on the matter. I’ll be going to KL to attend my sister’s wedding reception in PJ. She’s already married – the ceremony was held yesterday at Auckland, New Zealand and she’s coming back with her husband and my parents for the KL reception before heading home to Sibu for the reception over here.